Four years ago Sarah Outen began her London 2 London via the World expedition, traveling eastward by bike, kayak, and rowboat. During the past two legs of her expedition she kayaked for 101 days and 2500 km along the Aleutian Islands until landing in Homer Alaska. 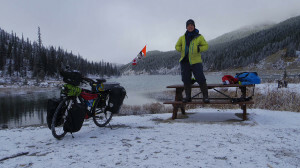 Next she cycled from Alaska halfway through Canada and halfway through the US enduring a long, cold winter. I previously spoke with Sarah in Episode 28 about the earlier legs of her adventure and you can learn more at her website sarahouten.com. Sarah Outen, welcome back to the show. Great to chat to you again Paul. Next shout from home!